Oh hiiiiiiiiiiiii there. Happy Friday. To say that I've been slacking in my extra-curricular department lately would be an understatement. I either need to cut down on jobs, hobbies, or both. Or perhaps I should just quit sleeping? It's honestly cutting into my video games and Sephora shopping schedule. Speaking of Sephora, you can tell I'm getting old, because I bought alllllllll skincare from the Rouge preview sale (20% of Rouge with code YESROUGE). Drunk Elephant, Dr. Jart+, and Peter Thomas Roth, come to me. Let us hydrate together. Since I couldn't let myself not do at least something fun, I added some falsie tweezers from Tarte into my basket. Truly, truly going wild. Anyway, here's something I wore to work because it's still hot. It's all from Old Navy because they have comfortable clothes and I don't like things touching my body right now. I saw a woman yesterday wearing full pants, long sleeves, and knee high boots and I thought lady...calm down. Shirt, Old Navy (exact, on sale!). 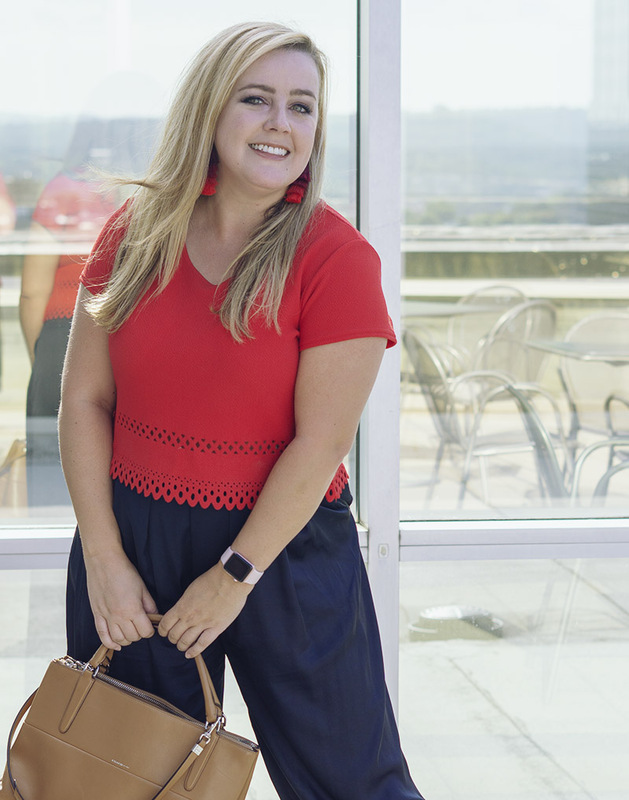 Pants, Old Navy (exact, very comfy!). Behold, the compliment shorts. No matter where I wear these things, someone stops me to compliment them. I'm not sure why I wear anything else. Funny story about these shorts, though. They were almost the shorts that weren't. I had to make an exchange with Trunk Club and told my stylist she could toss some other stuff in there for me to check out. 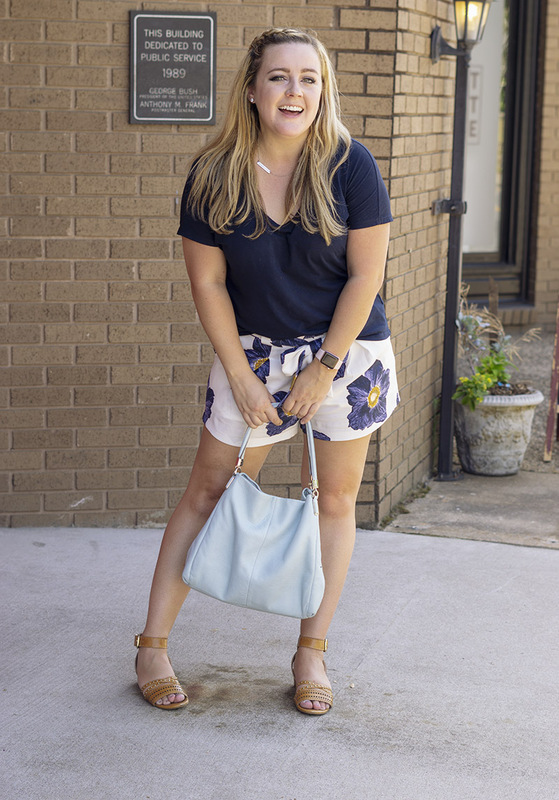 It was a particularly busy week so I didn't really get to do a full try-on and blog post, but the morning I was boxing everything up I picked up this bag and said, "Oh, this is a cute print. Are those shorts?" Mr. AJ and I are literally about to walk out the door and I ran to the bedroom to try these on. He was watching me try to shimmy into these shorts saying, "You're never gonna get those on." Which only made me shimmy harder because DARNIT I KNEW THEY'D FIT. They just needed a little coercion. I was in a hurry, after all, and elastic is a stubborn beast. I took one look in the mirror and said, "Okay, those are cute," before tossing them aside and taking the rest of the trunk down to be picked up. Long story longer, they fit, this was a great impulse buy, and I've worn them almost once a week since. They're not super expensive and look way cuter in person than on the website, so I'd give them a try if they have your size (these are the large and I'm a fairly solid 8/10 these days). Shorts, J.O.A via Trunk Club (exact). Shoes, Sole Society (similar from Asos). Y'all know I love full disclosure. These pants didn't zip all the way up today. So I found a shirt that would cover the zipper, and I went to work, because I'm fabulous and I don't need my pants to zip. I got these pants in NICE, FRANCE, yo. Pretty sure people are a lot smaller there because they only eat cheese and bread or something. Am I gonna let slightly small pants ruin my day? No way, Rosé. Most people complimented my shirt anyway. Top, Asos, I think (cute option from XXI). Pants, H&M (similar from SheIn // decent option from Macy's). Heels, Cynthia Rowley (similar from DSW). Bag, Coach Borough (Shop Borough on Poshmark // similar from Guess). Earrings, Forever 21 (check in store - i have these too and they're cute!). Lol. Sorry everything today is so old.